April 28 2008:	After the Thursday morning session with the Alinghi sailing team, media representatives were taken out on the water and some got to sail on one of the Volvo Extreme 40s. 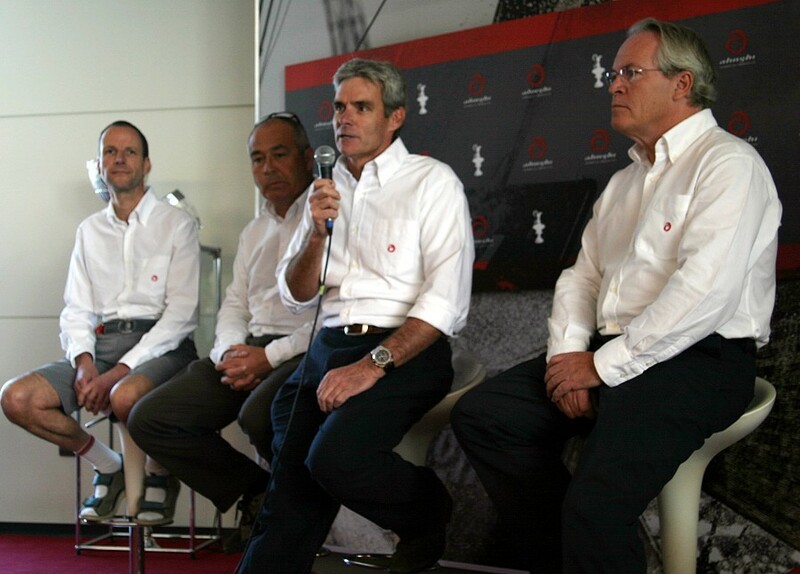 Following the sailing, it was the turn of the Alinghi design team to face the press and explain the schedule for the design and build of a multihull for a Deed of Gift match with BMW Oracle. First to speak was the design team's co-ordinator, Grant Simmer. Left to right: Michael Richelsen, Dirk Kramers, Grant Simmer & Rolf Vrolijk. 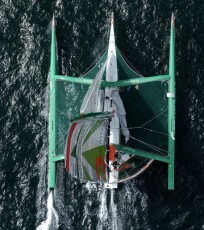 Our job is to design a multihull to race Oracle in ’09 and we are working towards May ’09. That is the focus of our activity, but I will just mention the legal situation; we are working on the design side, but we also have to achieve that May ’09 date. 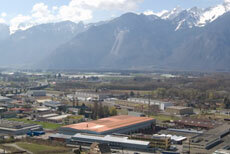 We have, recently, put in an appeal and the purpose is to strengthen our position to achieve that May ’09 date. That said, we are looking forward to having a match, to going sailing and, from the design side, it’s a pretty exciting project. 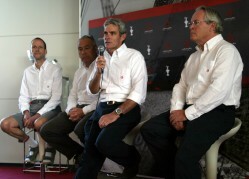 Alinghi obviously has had a very successful design team, since it has won the last two America’s Cups and we have supplemented that team, since the last Cup, adding some more strength to it. Until November, we were working towards developing a class boat, which we were calling the AC 90. Then, on the 27th of November, we had the first decision from the Supreme Court of New York and Justice Cahn said that, basically, GGYC was going to be the Challenger of Record and that meant we had to stop working on the AC 90 and start working on the multihull. So that has been our focus since the beginning of December and we took the approach that, rather than bringing in a whole new design team, or employing an outside design office, we would use the strengths that we had in our team and supplement those strengths by using a couple of very experienced multihull designers in Nigel (Irens) and Benoit (Cabaret). That is where we are; we are very close to starting construction of a multihull and right at the final stages of design. We are at the point of making some very important decisions over the next couple of weeks. So, I will hand over to Rolf, who, hopefully, won’t tell you what those decisions are, but will tell you about the process. As Grant said, we were working quite hard on the AC 90 until December when we, more or less, stopped and began to focus on this new challenge. Of course, it’s very interesting, but it is also a very unknown area and we were aware that we would need some outside assistance. It is also a very long process, not only because we do not have 20 years of experience of multihull design, but because this is something completely unique and new in the sailing world. So, we really had to start working on our tools and try to predict this kind of boat, so the team of Michael Richelsen really had to invent the tools for a multihull, which is quite complicated, and that that takes time. So, basically, we spent three months getting to understand the systems and the concepts of what is a new product for our design team. We had multihull experience within the team; Dirk (Kramers) was involved in the cats in ’88, Kurt Jordan was responsible for Playstation, Mike Screiber was responsible for the sail programme for Dennis Connor. So, we did have multihull experience within the team, but we all realised that we have not been working on this kind of project in the past years and we agreed that we didn’t want to be arrogant, we wanted to get someone else in to help us and support us and that is where Nigel Irens and Benoit Cabaret came into the game. We approached them at the beginning of December and they have been with the team since then and we really want to use their wealth of experience. Even if that experience is not exactly in the direction in which we are going, they do have much more experience than we have, in these kinds of multihulls. So, they have joined the team to look over our shoulders and make sure we don’t make too many mistakes. That is just one part of it, but the design process continues, it is an ongoing process and we still have to do our homework, but we are now just about ready to start construction of the boat. The construction period is not as short as some might expect. It is a huge undertaking especially on the side of materials; this project will use about three times the amount of carbon fibre used in the old America’s Cup boat, the parts are multiple numbers of what we have had up to now, the hours to build this boat are at least twice the number, plus you have many different parts, so you need to make tools. You have at least 3 to 4 months to make the tools, before you can make the boat. So, it is not realistic for us – and this is what we have been saying – to build a boat in four months, go sailing in six months; it is impossible. Now I want to hand you over to Dirk, who will talk a bit more about the structure and the challenge of designing a boat like this. This is something we are all excited about, but we are also realising that this is something new. Yes, this new boat is going to be quite exciting for us designers. It’s a bit like being a kid in a candy store, but the problem is that it isn’t a case of the perfect design it is the best design we can achieve in the given amount of time and a lot of our work is designing, with the boat builders, to figure out what we can achieve in order to go racing next May. So, the kid in the candy store hasn’t got a lot of time to get his candy and that is where we are now. These boats will be just something you’ve never seen before. They will be inshore versions of the boats you’ve seen all over the magazines, like Groupama 3 and Banque Populaire, if you can imagine a day racer version of that, it’s about what we are going to get. Of course, trying to get the maximum amount of stability, for the minimum amount of weight, is going to be the key to performance but, when it comes to loads, hardware has to be developed to deal with these loads and, although there is a basis from the offshore boats, things like winches, ropes will have to be developed for these sized boats and that again is one of the limitations that we need to put ourselves under. The other side of the development is the whole sailing side. How will we sail these boats; what are the manoeuvres going to be? How do we take the sails down and how do we get them up? All these details need to be worked out, so we are working quite closely with the sailors and the riggers. This has to be incorporated into the boat and that is part of the process that has been happening up to now. So, that is really, in short, the story of the engineering side. I wish I could give you nice numbers, like lengths and displacements and so on, but I can’t, so I’ll hand you over to Michael, who has been doing all the predictive tools. What do you do when, suddenly, you’ve got a whole new animal and you have to predict how it’s going to behave when it comes out of the box? I think the best analogy is building with Lego blocks; over the years you’ve collected some building blocks, which are the basics of the different parts of the boat, the sails, the mast and so on and you put these pieces together and, eventually, come up with a model that represents reality. We’ve done this a lot, over the years, with the V5s and we took the blocks apart and put them together again, in a different way, and came up with an AC 90, because the design is different, but the basics are the same, because we still use the same blocks. Then we came to the DoG boat, so we took the blocks apart and started to build them up again and, in the process, we realised that there were some Lego blocks we were missing here. So, what do you do? You either go out and buy a crate of new blocks, or, better still, you find someone who has got the blocks and ask them to come over and play Lego with you and when you share your blocks you build something that you’ve never done before. So, the unimaginable gets built up and you slowly begin to realise the potential of what these boats can do and it is going to be very fascinating the first time these boats go out there. I’ve been in the America’s Cup for quite a few years, first as a sail designer and then I got a chance to navigate and, this time round, I am rapidly becoming half a lawyer. For most of my working life I was, basically, trying to work my way around rules that were making my life difficult and then, recently, I found myself working with the guys who were trying to write the rules for the AC 90 class. There were people from all the syndicates, basically, sitting round a table trying to do the same thing and write a rule that wouldn’t get tripped up by radical design. It was quite fun watching them helping to try and make their own lives more constrained. Since we started thinking about the multihull, I realised there wouldn’t be much opportunity for me, because I know nothing about multihulls. I’ve sailed once on an A class catamaran and a couple of times on Hobies and that’s it, but as well as being in new territory for the boat we are for the rules of the actual event and it is quite obvious that we have to organise this event. So, I’ve been working on being a sort of liaison between the design team and the legal team and I’ve started to think about the rules that might govern this event that’s coming up. It’s quite fun to have a brief that doesn’t require me to come up with a certain amount of work every day, like all the others have to do. For Grant Simmers. Is there a finite budget for an event in 2009 and, if it were to be in 2009, how would that budget compare with an ordinary Cup in 2009? Grant. Surprisingly, it’s not that different. The boat building part of an America’s Cup syndicates budget is not that big; around 10% of the total. 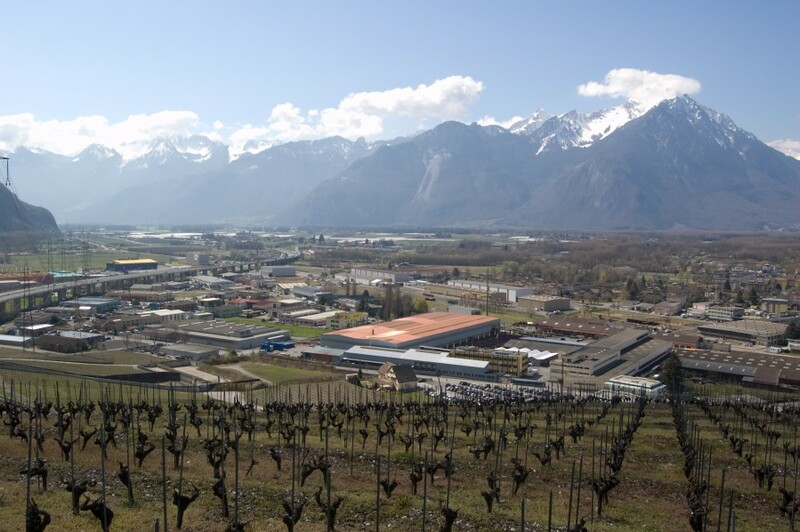 In this campaign it’s a lower percentage, but for this campaign a lot of the peripheral activities that were included in the overall Alinghi budget have been cut off, so the overall budgets are very similar figures. The percentages are slightly different because these boats are more expensive to make, but the human resources and wages are the most expensive part for any America’s Cup team. For Rolf Vrolijk. This is probably going to be a two race event; one windward/leeward and one triangular. What’s the fastest type of multihull for that, one with two hulls or one with three? Rolf. That’s an interesting question. I think it depends on a number of things and there are some pros and cons to consider before one can make that decision, including the conditions one can probably expect. Have you already made the decision? Rolf.. No, we haven’t 100%. For Grant Simmers. Can we go back to the money side? What sort of money are we looking at for a two race event? Grant. I’m embarrassed to tell you. Last Cup we spent nearly €130 million, in a 4 year campaign, and it’s proportionately similar. For Nigel Irens. Given the courses for two races, tell us the advantages of catamarans and trimarans. Nigel. I can only speak from the vantage of the offshore context. 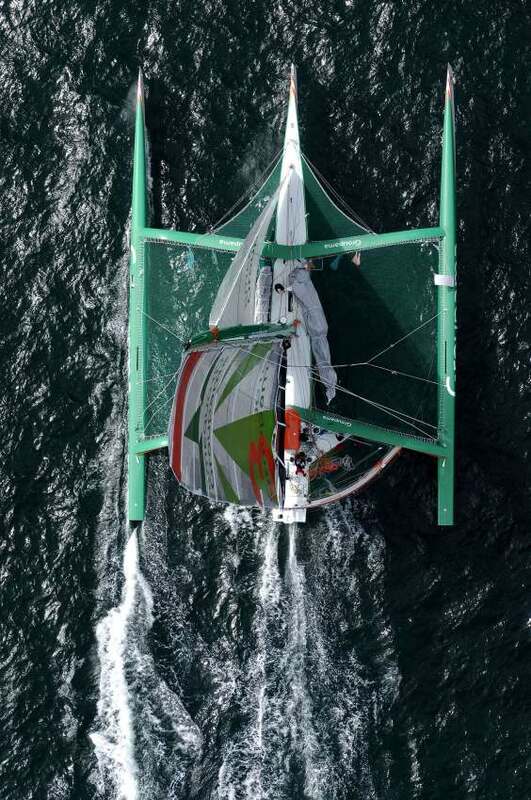 The problem in offshore racing is that the stability curve of a catamaran is very violent; you are very stable this way, then – all of a sudden – you are very stable that way (indicates upside down). That’s very unsuitable for offshore racing and especially for single handed racing, because you cannot be expected to keep the boat on the edge for a long time alone. That said, let’s be quite clear about this situation; Rolf has said that they aren’t experts in this, but the fact is that nobody is; this is a whole new ball game. We’ve come in, because we have this offshore experience, which is in big multihulls, but that’s all you can say. When I heard that this was going to be fought in big inshore multihulls I thought, well the only people in the world that have any experience of this are on the Alinghi team, so I was quite surprised there was a challenge right in their court. So, we are just adding one small component to this. On the Swiss lakes, there are a variety of trimarans, catamarans and halfway houses and I don’t think anyone can really say what is fastest. We’ve all had the same opportunities to dream up the fastest boat, but I don’t think it’s clear at all. We all have our leanings, but that doesn’t mean to say that they are right. You could say that the very best of trimarans and the very best of catamarans are pretty much as good as each other, but this event is likely to be won by the best concept of boat, in which the general proportions of the boat are the best configured; that’s all I can say. For Dirk Kramers. Leaving all the politics aside and thinking purely from a design point of view, given the choice of designing say a Version 6, an AC90 or a multihull, what’s the most exciting? Dirk. Personally, I enjoy sailing multihulls, but my job has been to design lead mines. This is much more interesting as far as I’m concerned; with Version 5 boats, we kept on complaining how we were just refining and refining and refining and not really making any breakthrough. The old Version 5 class was something where you just had to keep working on little things and this game is about getting the concept right. For Tom Schnack. When you say that, under the Deed of Gift, the boats must be built in the country how does that work with materials? Tom. We believe it has always been the case that materials were sourced wherever the best was available, so the best wood for hulls and cotton for sails would not, necessarily, have come from within the country. It’s the same with carbon, it’s a raw material that isn’t made in many countries, so we think that teams are free to source carbon. Next: Alinghi's timeline on attempts to reach agreement with GGYC.